The month of May, known as the Merry Month of May, has been celebrated for over 2,000 years as a month of joy, hope, love and romance. Mayday, the Druids believed, divided the year in half and it was hailed as the first day of summer. They lit fires through which men and their girlfriends jumped for good luck. It was the Roman Festival of Flora, the goddess of fruit and flowers, from the 28th April-2nd May. Ancient Babylon apparently had Maypoles woven with ribbons. They were phallic symbols and girls danced round them to encourage fertility. 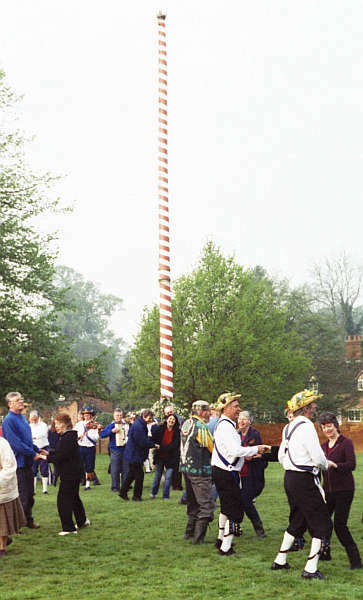 But some people deny this and say that the beribboned Maypole was invented by John Ruskin in the 19th Century. Perhaps he just re-invented it. 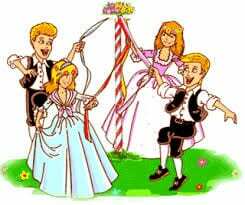 By the Middle Ages every village had a Maypole. Bringing it in from the woods was a great celebration. Mayday, or Garland Day, celebrated the end of frantic farming after the winter, so it was a convenient day for a holiday and often raucous celebrations. And the celebrations continue through the month in Britain with some unique and eccentric customs. Young girls would rush outside on May the 1st to wash their faces in dew. It was supposed to give them a lovely complexion and remove freckles and spots. Thakeham Morris welcome the sunrise on May the 1st at Chantry Post on top of the South Downs. It’s a very simple affair. It is their first dance of the season. They meet just before sunrise (around 5:30am), then usually perform a few dances in front of a smallish crowd (usually a few relatives, but sometimes supplemented by early morning runners, dog walkers and occasionally surprised van drivers who have spent the night in the car park). Rochester, Kent, holds their Sweeps Festival, the first weekend in May. It’s a pagan tradition and coincides with the chimney sweeps welcoming the summer so they could clean all the dirty chimneys. Jack in the Green is woken at dawn and the street’s filled with dancers and musicians. Whitstable, Kent, revived the Jack in the Green festival in 1976, followed by Hastings in 1983. It’s now a major event. They also host the Maydayrun, when thousands of bikers travel 89kms from London to Hastings, ending up on the seafront. It’s been held for over 30 years. Lincolnshire holds their Spalding Flower Festival. Thousands of tulip-covered floats parade through the town. Derbyshire has several well-dressing ceremonies in the Peak District. It dates back hundreds of years and the true origins have been lost. Beating the Bounds dates from the 5th Century. Parishioners asked God to protect their crops. During the Reformation it provided the community with a boundary map. It’s celebrated now with Ganging Beer and Rammalation biscuits. In Sussex around this time, it’s Legover Day. (No, it’s not what you’re thinking!) It’s a tradition connected with fell-runners climbing over stiles, walls and streams. There are a lot of customs connected with cheese. Early May Bank Holiday Monday is the Stilton Cheese Rolling in Peterborough 10am-3pm. Large round blocks of wood are rolled along the High Street for a prize of Stilton cheese and bottles of port. Around the 8th May Helston, Cornwall holds their Floral Dance. It’s one of the oldest customs in Britain. The Minehead Hobby Horse is celebrated. So is The Padstow Obby Oss in Cornwall, the oldest May Day celebration still taking place. It dates back to the 14th Century. Thousands of people go to see the two famous Hobby Horses, the Old Oss and the Blue Ribbon Oss. Celebrations start at midnight, the night before. The town’s full of bluebells, forget-me-nots, cowslips and sycamore twigs. Hasting, Sussex. Hold the Blessing the Sea. It dates back to Medieval times. Oak Apple Day, also known as Pinch-Bum Day and Nettle Day, celebrates the triumphant return of Charles II. People used to wear oak apples in their lapels or hats because King Charles was saved from capture by hiding in an oak tree. If they didn’t, they could be stung with nettles, or kicked and pinched! St Briavels, Gloucestershire. Bread and Cheese Day. After Evensong on Whit Monday, basketfuls of bread and cheese are thrown from a wall near the castle and people in the lane below scramble for them. Brockworth, Gloucestershire. 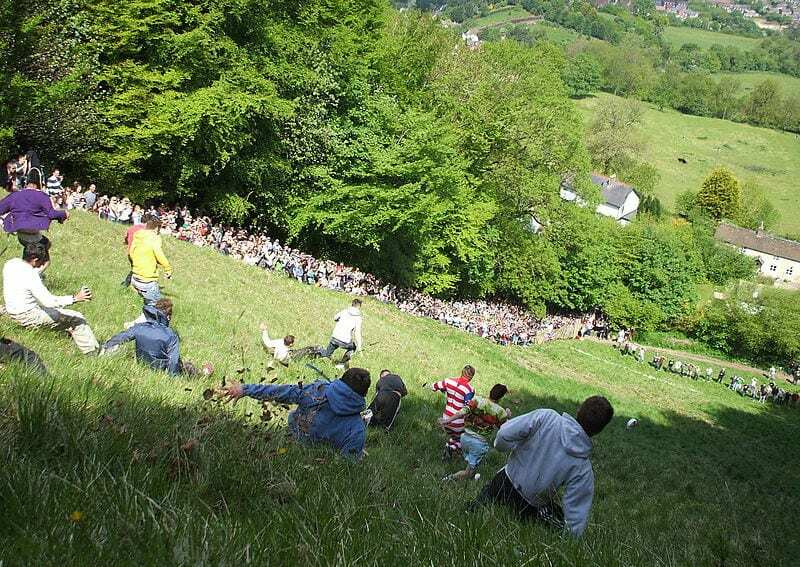 40,000 spectators gather on Cooper’s Hill to watch a 7lb double Gloucester cheese roll down a steep slope, chased by a crowd of running and rolling competitors. The winner gets the cheese. Tetbury Wool Sack Race. Competitors run up Gumstool Hill with a 60lb sack of wool on their backs. As the sun sets, white-coat-clad competitors stuff straw down their trousers, ready for the British Shin Kicking Championship. Entrants grasp each other’s shoulders and try to kick each other’s shins. In mid-kick, they try to throw each other on the ground. It dates back to the 17th Century. Wherever you go in Britain in May, weird customs are taking place. 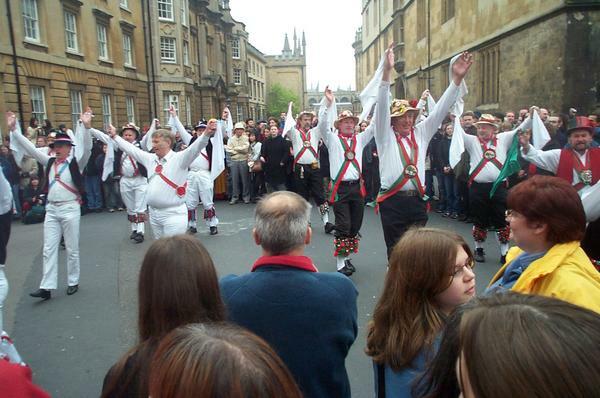 The Thakeham Morris Dancers are looking for more dancers and musicians to join their group. Or you could contact your local group to see if they need any new members.